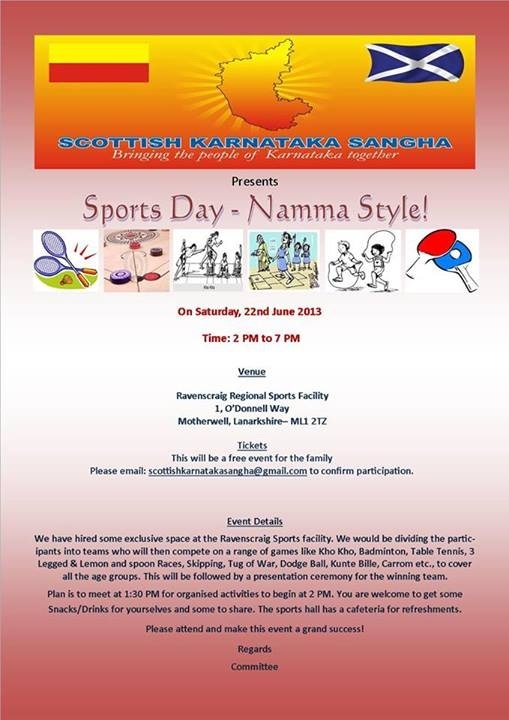 If you plan to attend the event and not let Scottish Karnataka Sangha know, this is your final chance to register your interest with no of Adults/Kids participating. Please arrive on time at 1:30 PM for activities to start at 2:00 PM sharp. On Arrival you would be notified of the team you are in and the team leader working with the team members will decide which participant will compete in which activity. Confirmed attendees (Adults & Kids) will be divided up into 4 teams. Each team will have selected participants competing on a variety of activities (details below). At the end of the day, 4 most active/enthusiastic participants from each team would receive a momento. As advised in the invite please get snacks/drinks for yourselves and some to share. Please note that cafeteria facilities are available at the center as well. Like in the Ugaadi event the Sangha T-Shirts will be on sale for £5. 1:30 – 2:00: Registration / courts (badminton/table tennis) free for all to warm up. 2:00 – 3:30: Badminton/Table Tennis competitions. 3:30 – 4:00: Courts will be cleared. Carrom / Kunte Bille. 6:30 – 7:00: Presentation, Vote of Thanks & wind up. This is a free event for the family. 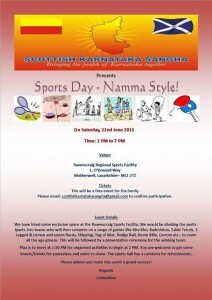 Please email scottishkarnatakasangha@gmail.com to confirm participation.